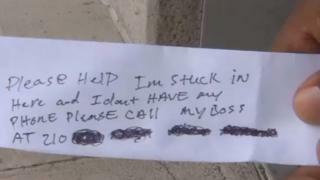 A Texas man who found himself trapped inside a cash machine slipped "help me" notes through the receipt slot. 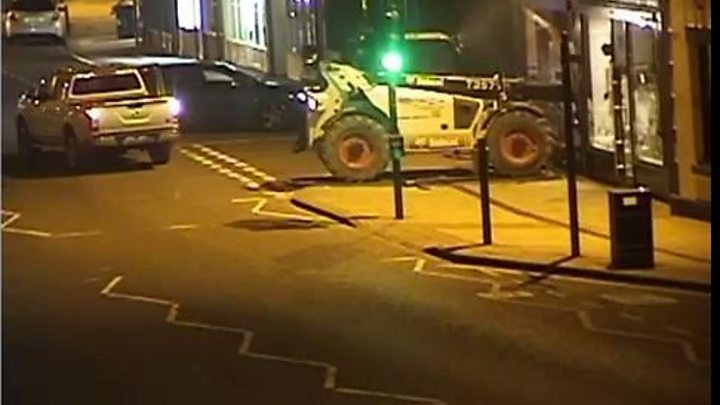 The man, who police say was working on a renovation of the bank, left his phone in his vehicle before getting stuck in the drive-thru ATM's vault. The unnamed workman was freed after shouting to ATM users, who continued withdrawing cash throughout his ordeal on Wednesday in Corpus Christi. Police thought it a hoax before kicking in a door to withdraw him. "Sure enough, we can hear a little voice coming from the machine, so we're all thinking this is a joke, it's gotta be a joke," said police officer Richard Olden. One handwritten note slipped by the trapped man to a customer said: "Please Help. I'm stuck in here, and I don't have my phone. Please call my boss." The message included the employer's phone number. The man was freed after spending more than two hours inside the Bank of America machine. Officer Olden told local media: "Everyone is okay, but you will never see this in your life, that somebody was stuck in the ATM, it was just crazy."